A number of Northwest jazz releases made it into All About Jazz columnist Dan McClenaghan’s Top Ten of 2009. Always a fine pianist, Jessica Williams has driven deeper into her artistry since she started her own record label. This live set features Jessica Williams at the peak of her solo piano powers. A meticulously-crafted jazz/pop mix nod to the music of the late French musical Renaissance man, Serge Gainsbourg. A top notch quartet, sax and piano/bass/drums, sounding devil-may-care relaxed, giving some familiar tunes a wild ride. Thank you to everyone who has read and keeps reading Seattle Jazz Scene every day. We are quickly approaching our 1500th post! Keep sending in your Seattle jazz scene news stories. Tell your friends. Support your neighborhood jazz joint. Lawrence M. Halpern, Ph.D, 78, died peacefully in his home December 21st. Born in New York on July 3, 1931, Larry lived a large life and touched the lives of many. After graduating from Bronx High School of Science, Larry joined the Navy Corps. Later Larry attended Albert Einstein College of Medicine. He was an Emeritus Associate Professor at the University Of Washington School Of Medicine, Department of Pharmacology from 1965 to 2005. A pioneer in the world of pain management, Larry was a published, international lecturer and founding member of Hospice of Seattle. He also served on the board of many organizations. Larry was a patron of the arts, a board member of the Seattle Repertory Jazz Orchestra, and supported many individual musicians. He loved sailing and traveling with his wife Gail; was an avid photographer; a food lover who loved to cook, and a ham radio enthusiast. In short, Larry was a true renaissance man. He was a talented saxophone and flute player whose deep passion for music permeated all aspects of his life, leading him at 55 to attend Cornish College of the Arts, studying Jazz Performance. He attended the Centrum Jazz Workshop for many years, and became a member of the Seattle Flute Society, the NW School of Music Flute Choir, and Jim Knapp’s Big Band. Larry is survived by his wife Gail Arshon Halpern, his children Gordon Raphael, Lisa Halpern and her husband Jose J. Gonzales, Cherron Halpern, and his niece Anne Rosenbaum. Services have been set for 11:00a.m. on Wednesday, December 23rd at the Herzl Memorial Park, 16501 Dayton Avenue, Seattle, WA 98133. Remembrances may be sent to Hospice of Seattle or Swedish Hospice. In 1965, the Pulitzer Prize’s three-member music jury voted unanimously to award Duke Ellington a special citation for his prodigious contributions to American music, an award unceremoniously rejected by the Pulitzer’s 14-member advisory board. In truth, Ellington had his eye on loftier concerns. On Sept. 16 of that year, the Duke Ellington Orchestra premiered “A Concert of Sacred Music” at San Francisco’s Grace Cathedral, the first of three Sacred Music programs that he considered his most important work. These days there’s little argument about Ellington’s status as a singularly creative force in 20th-century music, but compared to his beloved standards and ambitious longer suites with Billy Strayhorn, his Sacred Music is rarely performed. A CBS News story about 71-year-old Pt. Townsend resident Andy Mackie. Seattle trumpeter Marriott tips his hat to horn heroes Freddie Hubbard and Miles Davis without ceding his own identity as a melodically inventive composer and consistently incisive improviser whose lines simmer anxiously without boiling over. 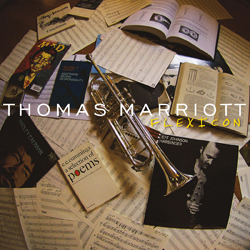 A top-shelf cast featuring pianist/keyboardist Bill Anschell, bassist Jeff Johnson, drummer Matt Jorgenson, saxophonist Mark Taylor and vibraphonist extraordinaire Joe Locke (on two tracks) brings Marriott’s expansive vision vividly to life.